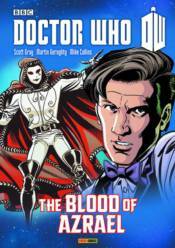 An outstanding volume of comic strips collecting the complete adventures of the eleventh Doctor and Clara from the pages of Doctor Who Magazine! Contains five linked stories by acclaimed writer Scott Gray: 'A Wing and a Prayer,' 'Welcome to Tickle Town,' 'John Smith and the Common Men,' 'Pay the Piper,' and 'The Blood of Azrael.' Includes a wealth of exclusive, brand new material revealing how the strips were created, featuring contributions and commentary from the writer and artists.